Wisteria is one of the most beautiful of all the climbing plants. Native to parts of Asia and North America, this fast-growing woody vine can grow up to 30 metres tall. It is deciduous in winter, and blooms in spring with pendulous bunches of pea-shaped flowers that can be blue, white or pink. There are lots of different varieties, but I think the best for a warmer climate like ours are the various forms of Chinese wisteria (wisteria sinensis). You still get a choice of colour, and the flowers are usually fragrant. Wisteria sinensis will certainly flower well at least as far north as Brisbane, but I'm not sure how successful any wisteria would be further north. The best position for a wisteria is in a sunny spot, in good rich, slightly acidic well-drained soil. The root zone likes to be kept moist, so keep the area mulched. Wisteria grows quickly, and it will need a very strong support. You can easily train it to grow over a pergola, or along a verandah, or even as a weeping standard. 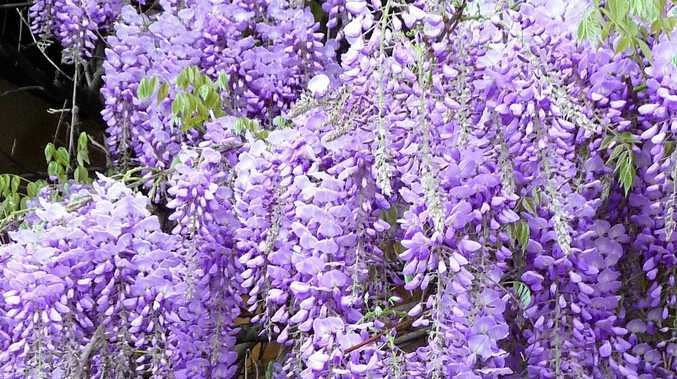 It's important to prune wisteria to keep it in shape and to maximise flowering. You can prune hard after flowering, once the new shoots have formed, taking them back to back to the second or third node. Tip prune during the growing season to encourage more side shoots to form, and to keep the plant to the desired size. I'd suggest you also remove any seed pods that may develop. Don't prune in winter, because this will remove the developing flower buds. If you are not prepared to prune at least annually, and ideally a couple of times during summer as well, then I'd suggest you choose a different plant. If left to its own devices wisteria can be invasive.